Dr. Mark Hermann joined the Spectrum Medical in 1990 after attending college at Emory University in Atlanta Georgia and receiving his medical degree from Georgetown University in Washington, D.C. (1985). Dr. Hermann completed a surgical internship at St. Vincent’s Medical Center, Yale affiliate, prior to his Orthopedic Residency training at Carolinas Medical Center, Charlotte, North Carolina. 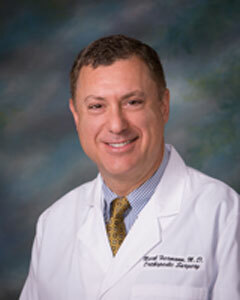 Dr. Hermann’s primary subspecialty focus is in Arthroscopic Surgery, Sports Medicine and Joint Replacement Surgery. He takes special interest in shoulder and knee surgery. He is a member of the American Board of Orthopedic Surgery, American Society of Orthopedic Surgery, The Arthroscopic Associates of North America, The Wilderness Medical Society as well as a member of the local and state societies. He attends medical meetings and courses regularly on his subspecialty interests. Dr. Hermann is active in the community especially with the local YMCA. His hobbies and interests including biking, white water kayaking, mountaineering, rock climbing and most outdoor activities. He and his wife, Wendy, also share the responsibilities of raising their children, Mackenzie, Chelsie and Gavin.